Contact Rancho Santa Fe Security today to explore all the possibilities for access control in your business. Managing who has access to your business is one of the most important things you can do to ensure the safety of your employees as well as your facility. While access control has traditionally been used to simply monitor entrances and exits, the latest technological advances for access control offer many more useful features. Integration with video surveillance systems: Access control systems can trigger surveillance units to begin recording as soon as someone enters the building, providing additional accountability and a visual record of entries. This helps not only with security, but also with human resources time and attendance functions. Integration with energy systems: Lights and thermostats can be programmed to turn on when employees enter the building and turn off when the building is empty, reducing energy costs. Restricting access to equipment: Manufacturing/industrial facilities can restrict untrained employees from accessing certain equipment, to ensure safety and maintain compliance with industry regulations. 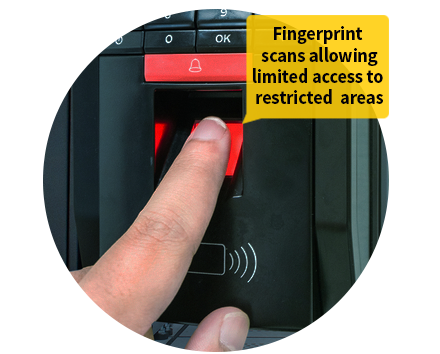 Biometric scans: Retinal scans, fingerprint scans, and facial recognition technology can be used in high-risk or sensitive areas to ensure that only authorized personnel have access. Wireless access control: In cases where installing cabling is cost-prohibitive or not possible, wireless access control is an option that offers strong signal quality and can be used in remote buildings.